I am a huge fan of "Portlandia" on the IFC. 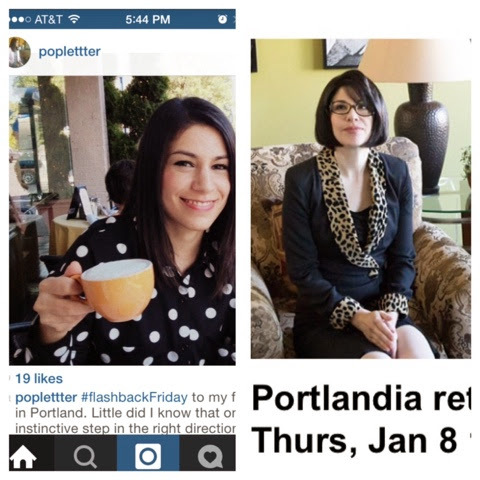 So much so, that I have decided my friend Natasha Rauf is Carrie Brownstein's doppelgänger. She too lives in Portland; is a writer, calligrapher, blogger, and campaign manager for a ChickTech, a Portland-based nonprofit fostering growth of women in the tech field. Natasha Rauf (left). Carrie Brownstein in Portlandia (right). Natasha is "Portlandia" personified. I'm serious. Put a bird on her. She surely deserves to have "birds suddenly appear every time she walks by." Yes I went there. Natasha is living art, an intellectual creative in Portland I'm honored to call "my friend with the famous face." Thing is, I love the show and Natasha adores the show just as much as I do. Only she's lucky enough to run-round with a face that looks like Brownstein's. What a gal! I hope these two will soon be friends.